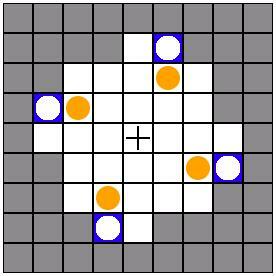 The punt mazes were introduced on the www.greylabyrinth.com discussion forum in March 2005. 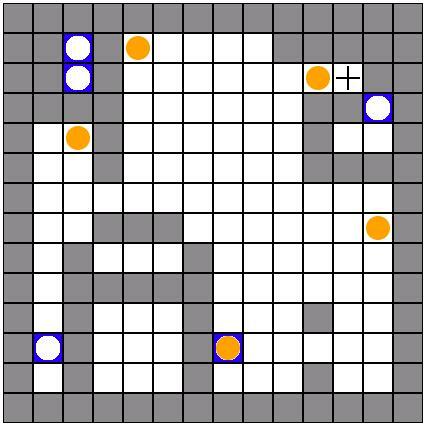 Conceived by greylabyrinth contributor (GLer) mathgrant, and subsequently implemented in java-script by co-GLer ralphmerridew, these little puzzles are best viewed as a particularly mean variation on sokoban. 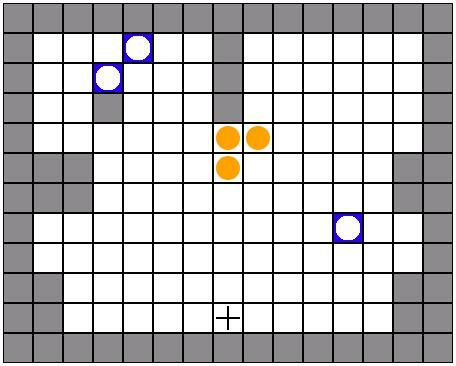 Like sokoban the target is to push objects (in this case punt-discs or 'pucks') around a maze to cover various targets. 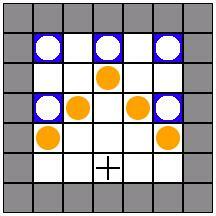 In a punt maze however the pusher slides forward tilt-style until it hits an obstacle, and a puck that gets struck will be punted forward a matching distance. 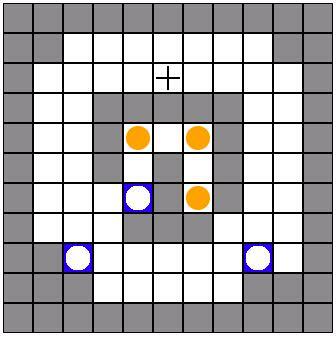 Use the grey walls to help position and manouvre the pusher (black cross) but beware, walls are no obstacle to a puck. 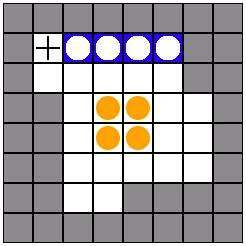 You can punt a puck through a wall or over and past another puck provided it comes to rest in a clear space. Punting a puck out of play (including onto a wall) is not permitted. 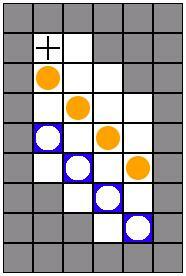 Use the black cross as a pusher to 'punt' the yellow pucks onto the blue targets. 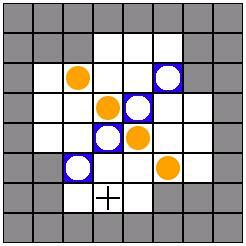 Click on a puzzle image (left or below) to launch a puzzle. Hit browser refresh to restart a puzzle. 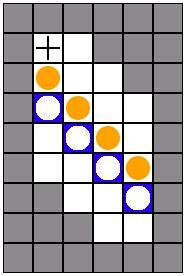 Use the arrow buttons provided to move the pusher (black cross). 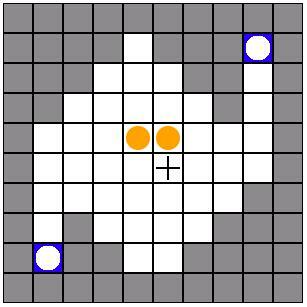 The pusher will run in a straight line until it hits a wall or a yellow puck. If it hits a puck the puck will be punted forward a matching distance. The following puzzles are some of my favourites from the greylabyrinth site, with a few extras of my own thrown in for good measure. The differing styles add to the fun I feel. 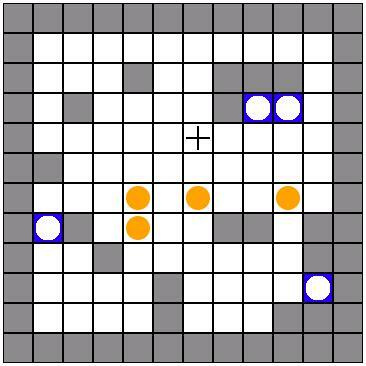 The puzzles are ordered in rough order of increasing difficulty (that is, they start tricky and then get worse). mazes - &COPY; 2005 mathgrant, fadeblue, zag & lostdummy of www.greylabyrinth.com, and Andrea Gilbert.